Cruiser There are 6 products. 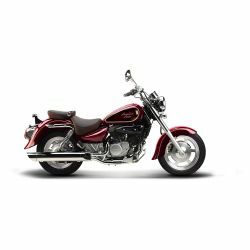 The smaller capacity GV Cruiser variants are unique in providing a full size Cruiser with powerful V-twin 8 valve DOHC motors that deliver a smooth and confident ride - normally only found in larger displacement machines. Enjoy style, quality and performance the Hyosung way. K-light is the new 125 Keeway cruiser, inspired by the look of the greats in its category. If you think of the Superlight 125 Limited as the younger brother to the larger-bore Superlight 200 cruiser, it all makes sense. Box 125i Sharp modern lines laid over a classic cruiser design ensures the Motorini Box stands out from the crowd.